Recylcing Workers say "NO!" to management's proposed cuts! Thread: Recylcing Workers say "NO!" to management's proposed cuts! Submitted by intexile on Tue, 01/19/2010 - 2:48pm. The IWW is engaged in contract discussions with the Ecology Center, which runs Curbside Recycling - the outfit that picks up recyclable trash in Berkeley. They have presented a series of demands for draconian cut backs. This includes demanding that the workers pay 20% of the cost of their health insurance premiums. Their position is that everywhere else such cuts are being instituted and they have to do the same. Our position is that these cuts have to be stopped somewhere, or, to paraphrase Harry Truman, "the cuts stop here." 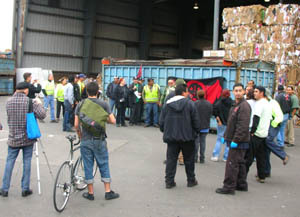 At the same time, Buyback - the recycling yard that is on the same property as Curbside and also under IWW contract - has announced that they will be laying off a worker, a first there.